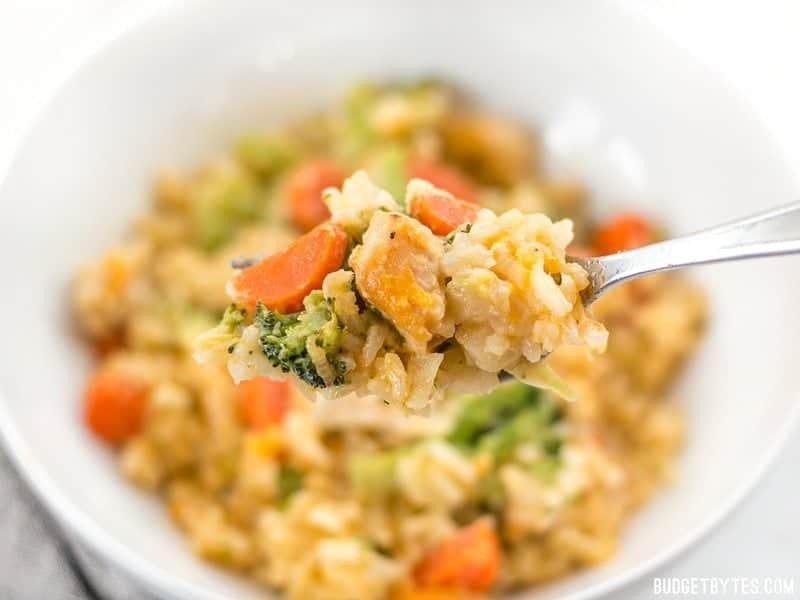 Just as with fried rice, day-old or chilled rice works best for this recipe because it’s a little more firm, allowing it to combine easily with the other ingredients without getting mushy. 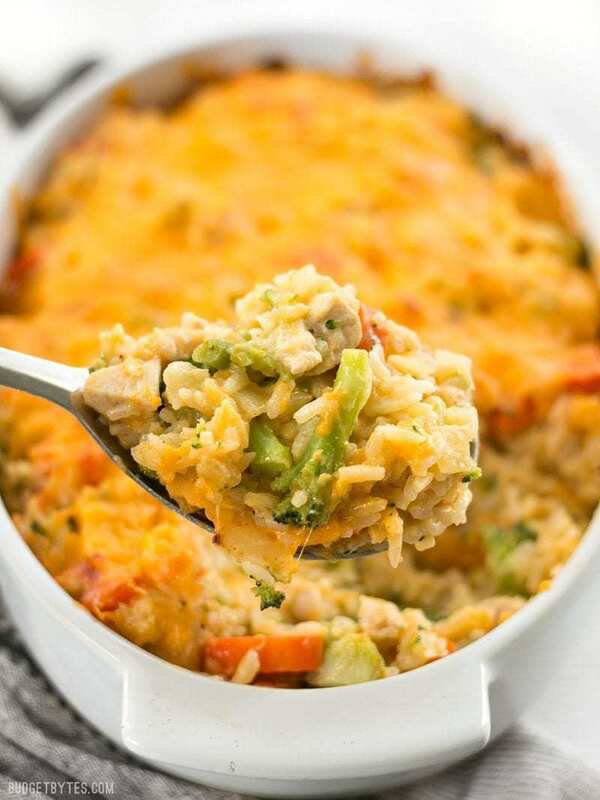 So, this Cheesy Chicken Vegetable and Rice Casserole is excellent for using up leftover rice, or if you like to cook big batches of rice and freeze it. One more note. If you want cheesy but just not super-duper cheesy, simply skip the layer of cheese on top and bake as-is (cover with foil), or top it with buttered bread crumbs for a crunchy topping. And yes, you can use brown rice for this. P.S. I ate this for breakfast this morning and I’m not even sorry about it. 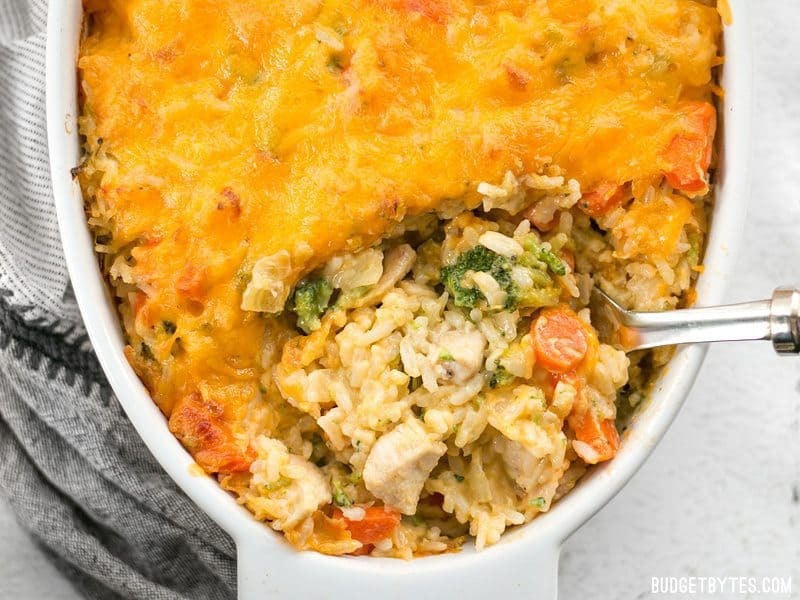 This Cheesy Chicken Vegetable and Rice Casserole is everything your comfort food dreams are made of. Take the broccoli out of the freezer and allow it to begin to thaw. Once it's soft enough to cut with a knife, cut the florets into smaller, bite-sized pieces. Cut the chicken breast into small 1/2-inch cubes. Season with salt and pepper. Heat a large skillet over medium, then add the olive oil and swirl to coat the surface. Add the chicken pieces and cook until slightly browned on the outside. Remove the chicken pieces to a large clean bowl. While the chicken is cooking, finely dice the onion, and peel and slice the carrots. Add the onion and carrots to the skillet after the chicken is removed and sauté until the onions are softened. Transfer the onions and carrots to the bowl with the chicken. 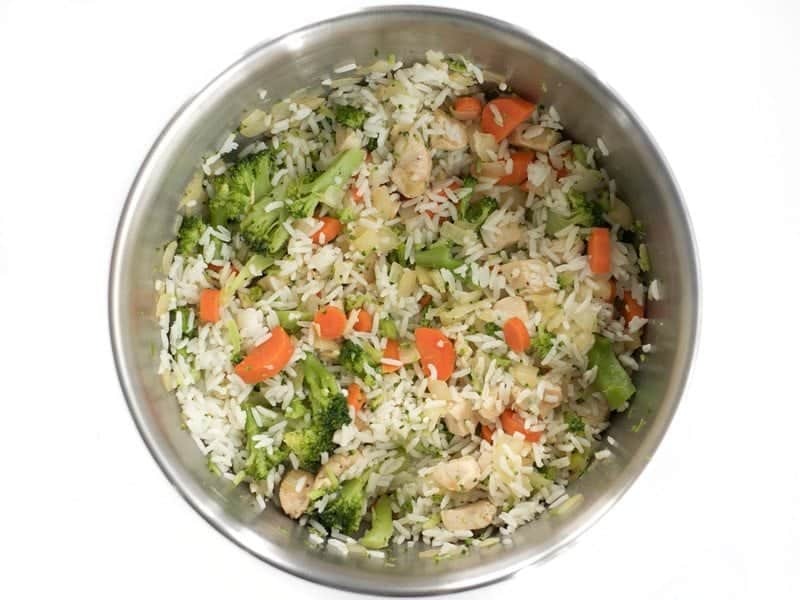 Add the chopped broccoli florets (even if not fully thawed) and the cooked rice to the bowl with the chicken, onions, and carrots. Stir to combine, then add 1/2 of the shredded cheddar (about 1 cup) and stir to combine again. Set the mixture aside. Begin to preheat the oven to 350ºF and coat the inside of a 2 quart casserole dish with non-stick spray. 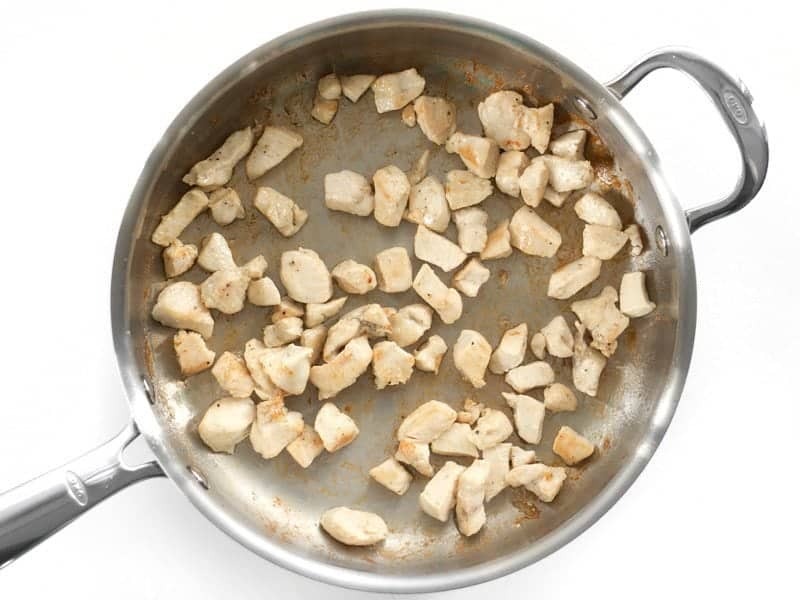 Add the butter and flour to the same skillet used to cook the chicken and vegetables. 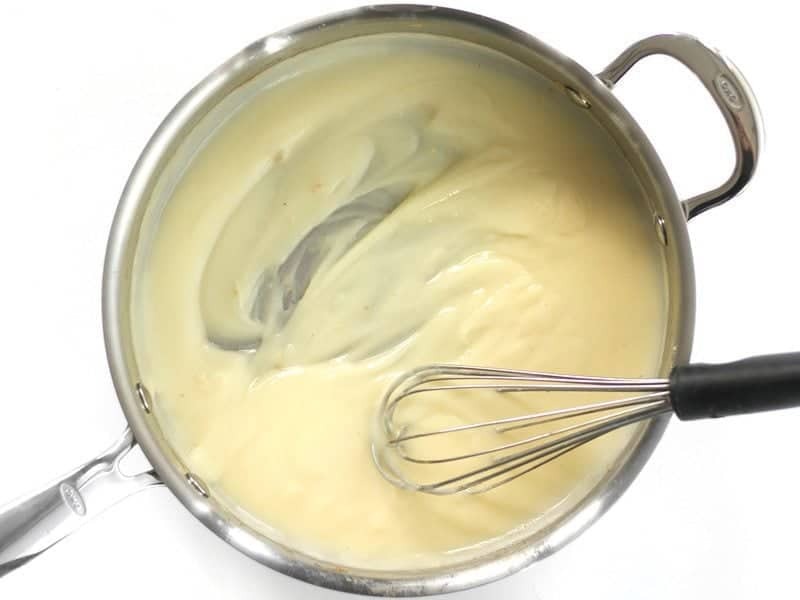 Cook and whisk the butter and flour over medium heat until it begins to foam, then continue to stir and cook for one minute. Slowly whisk the chicken broth into the flour and butter mixture. Allow it to come up to a simmer, at which time it will thicken. 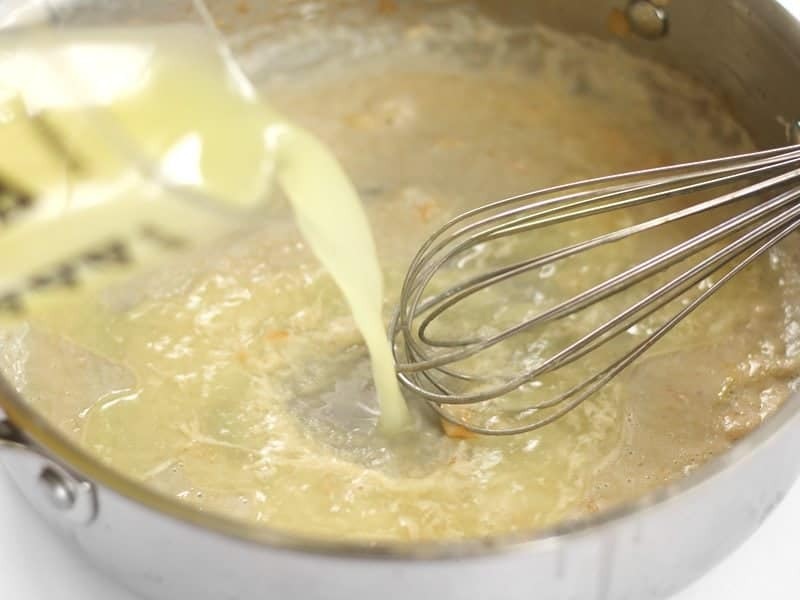 Once thickened, whisk in the milk and allow it to come up to a simmer again. When it's thick enough to coat a spoon, season with smoked paprika, freshly cracked pepper, and salt. Pour the sauce over the rice mixture in the bowl and stir until everything is combined and coated in sauce. Transfer the mixture to the casserole dish. 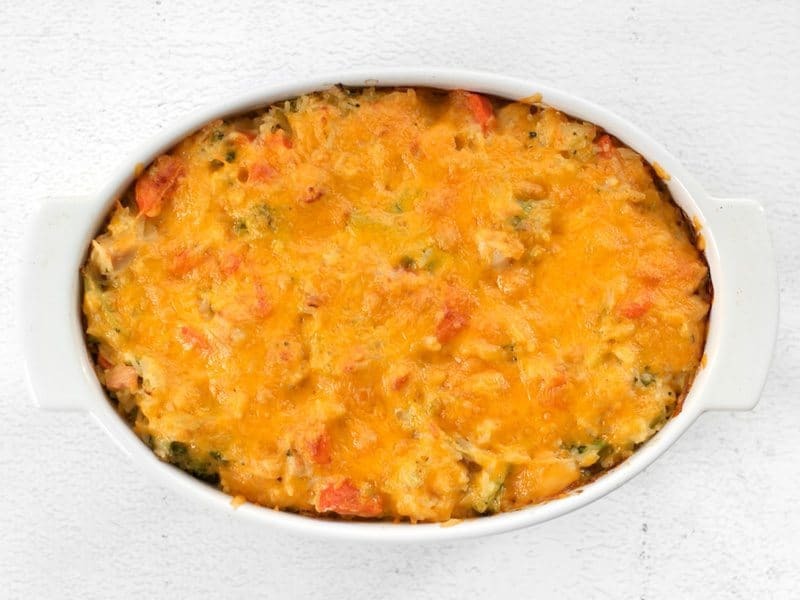 Sprinkle the remaining shredded cheese over the casserole. Bake the casserole, uncovered, for about 35 minutes or until it becomes golden brown around the edges. Serve hot. Begin by taking 1/2 lb. broccoli florets out of the freezer and allowing them to begin to thaw. Once soft enough to cut with a knife, chop them into smaller bite-sized pieces, then set them aside. Cut one boneless, skinless chicken breast into small pieces (about 1/2 inch) and season with salt and pepper. Heat a large skillet over medium, then add 1 Tbsp olive oil and the chicken pieces. Cook the chicken until it is golden brown, then remove it to a large clean bowl. While the chicken is cooking, dice one onion, and peel and slice two carrots. 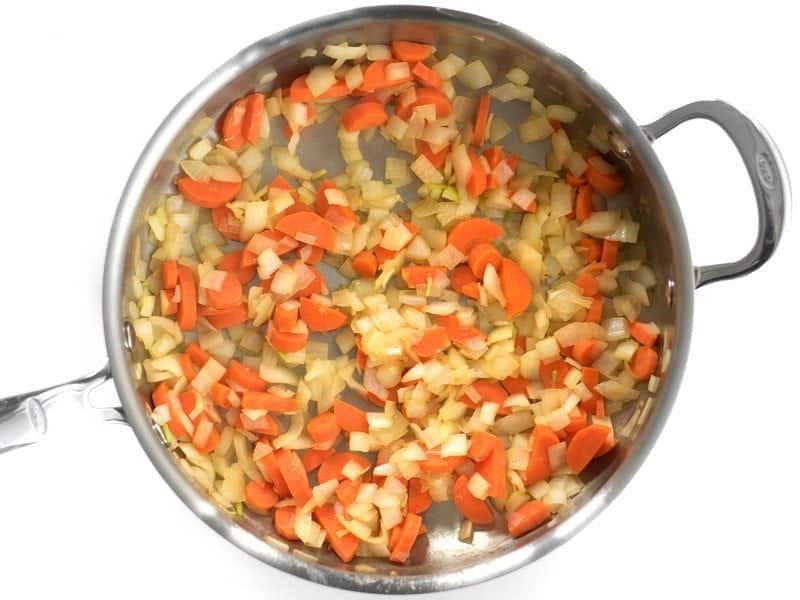 After removing the chicken, add the onion and carrots to the skillet and sauté for about 5 minutes, or until the onions are soft and transparent. Transfer the carrots and onions to the bowl with the chicken. Add the partially thawed broccoli and 4 cups cooked rice to the bowl as well, then stir to combine. 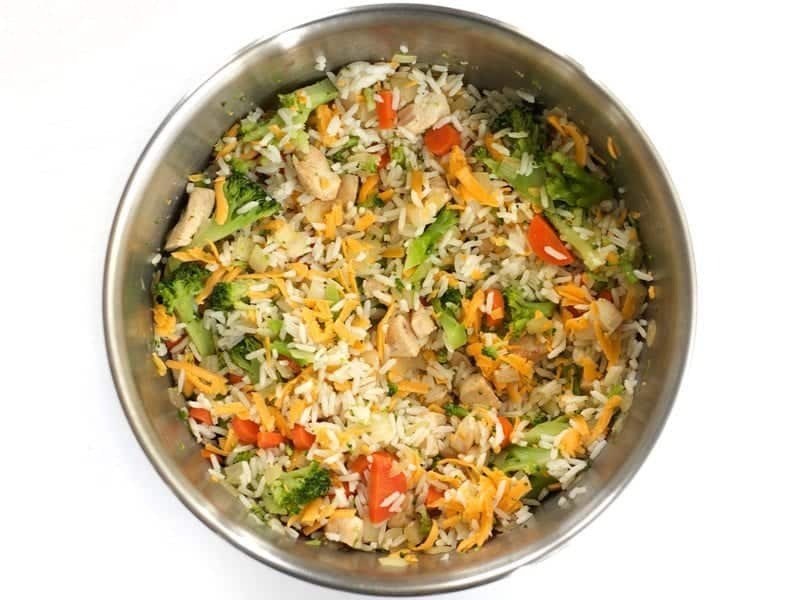 The cold broccoli and rice will help cool the chicken and vegetables enough so that they don’t melt the cheese in the next step. Add half of the 8oz. shredded cheddar to the bowl and stir to combine again. Set this mixture aside. Begin to preheat the oven to 350ºF, and coat the inside of a 2 quart casserole dish with non-stick spray. 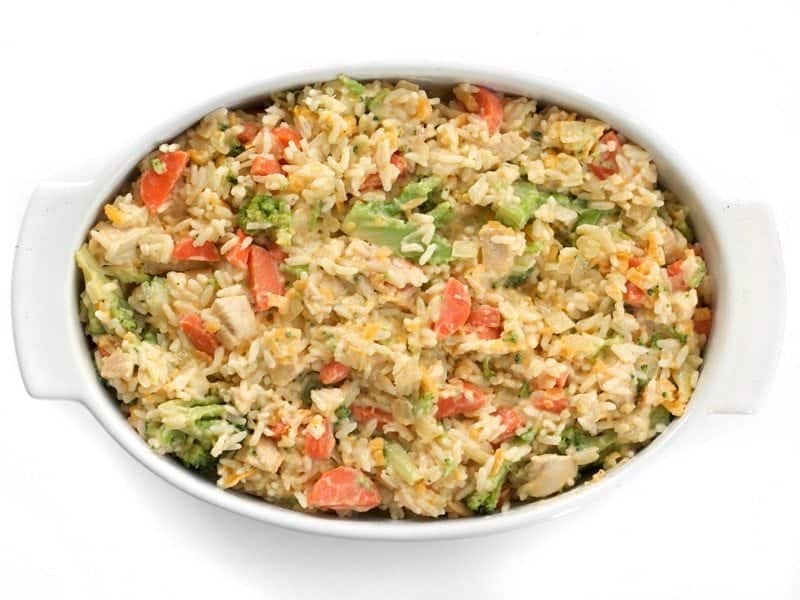 To the same skillet used for the chicken and vegetables, add 3 Tbsp butter and 3 Tbsp flour. Cook and whisk these two together over medium heat. It will start out looking like a paste, then it will begin to bubble and foam. Once it starts foaming, cook and stir for one minute. At which point it will thicken to a pudding-like consistency. 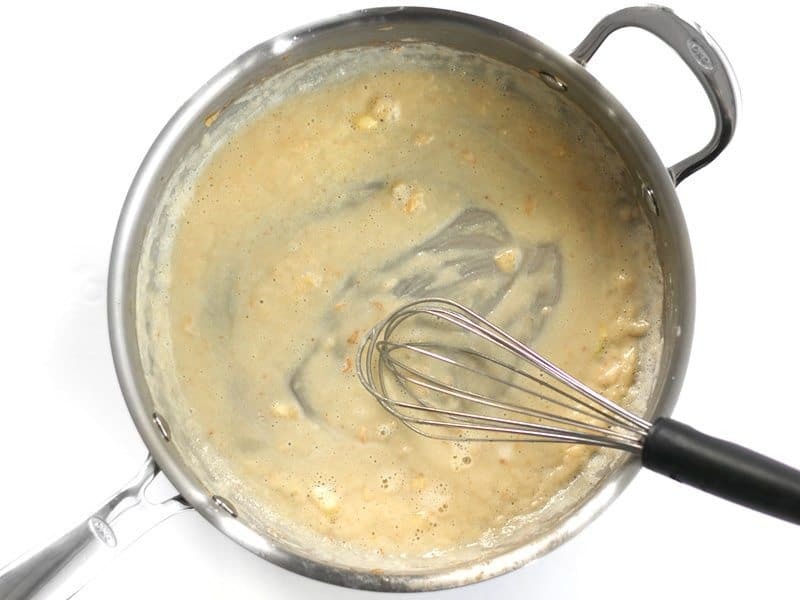 Then whisk in one cup whole milk and let it come up to a simmer again, at which point it will thicken to a nice sauce. Season the sauce with 1/4 tsp smoked paprika, some freshly cracked pepper, and about 1/2 tsp salt (you want it to be fairly salty so that it doesn’t get too diluted once mixed with the rice and vegetables). The orange-y color above is due to the smoked paprika. Pour the sauce over the rice mixture in the bowl and stir to combine. Spread the mixture into the prepared casserole dish. Cover with the remaining 4oz. shredded cheddar and bake for about 35 minutes at 350ºF, or until it begins to brown around the edges. And then the cheesy goodness is ready to devour! Can’t wait to make this it looks amazing! Would swapping the whole milk for light almond milk make that much of a difference in thickening the sauce? Should’ve read further to see that you’ve already answered this! All of the thickening power actually comes from the flour, so it shouldn’t matter in that area, but it probably will taste less creamy. 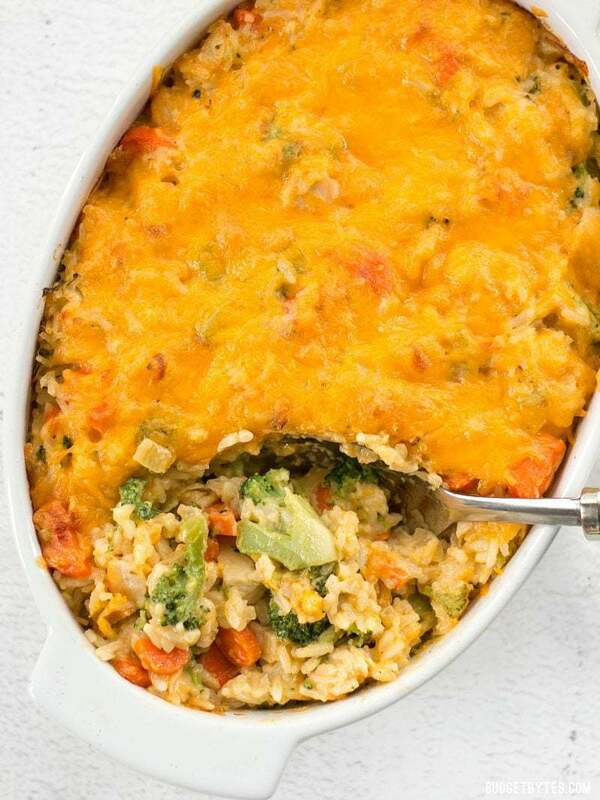 I was in a hurry at the store and ended up buying 2 boxes of rice a roni cheddar and broccoli rice to use in this recipe and it turned out deliciously cheesy. My boyfriend had 2 large helpings and we are both taking the leftovers to work for lunch tomorrow. Will definitely make it again! Can you substitute corn starch for the flour? I haven’t tried that, so I’m not sure what effect it would have specifically, but generally cornstarch and flour do create different textures and appearances when used to thicken liquids. I’m need to make this gluten-free, so I’ll just try my Jules GF flour. Is there a way to “favorite” this recipe? I have found a lot of recipes I’ve like on your website and would love to keep them in one spot! Do you think I could freeze this? I’m not sure on this one. 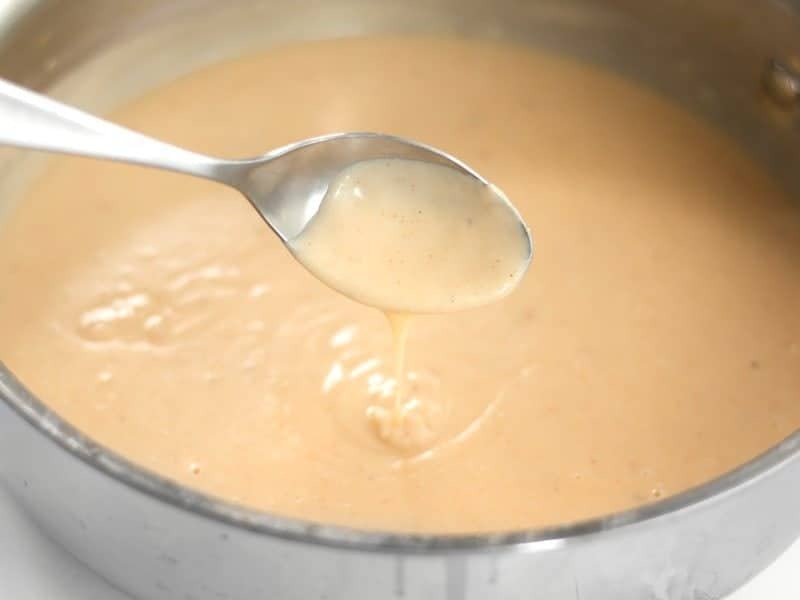 Sometimes flour thickened sauces, which this recipe contains, can break down after freezing and thawing. So I’ve made this dish twice in as many weeks. 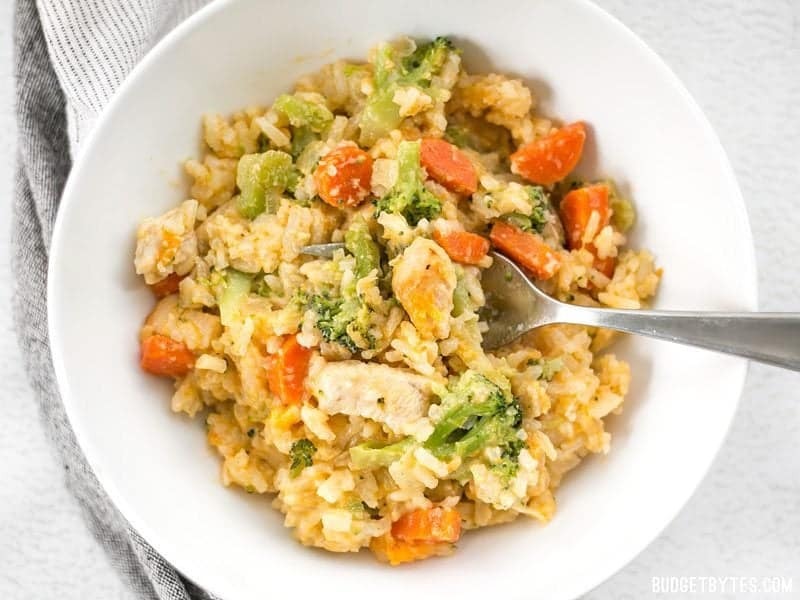 Hubby loves it and so do I. I was looking for a chicken & veggie casserole that didn’t use canned soups and this one was a winner. I played around with it both times. The first time around we thought it needed more chicken but when I added more chicken on the second time, it was too much. It’s a small amount of chicken used but it’s perfect. I also used fresh broccoli–it just needs to be cut smaller. And I doubled up the sauce portion. I do that with every recipe I try, just in case. With the extra sauce (and no cheese IN the dish, just on top) it was super creamy. So good! This turned out wonderful! I actually made a small mistake with this recipe, but it ended up tasting great anyway. I will absolutely come back to do the recipe justice. It’s getting cold here in Chicago and this is some great midwestern comfort food. This probably goes without saying, but to those with tiny kitchen (like myself), this recipe is going to get messy! I used all fresh vegetables and grated fresh cheddar, so I had a lot of dishes to clean. Still, it was very worth it. I think that would change it quite a bit, so I’d need to test it to see what adjustments would need to be made to have the sauce work correctly. Can you sub almond milk for the whole milk? Thanks again for sharing wonderful recipes on a wonderful site! I haven’t tried almond milk, but my guess is that it wouldn’t be thick or creamy enough. Wow, this was really good! Perfect ratio on everything too. I used leftover turkey. I’m positive it would taste better cooking the chicken as the recipe specifies. Thanks so much.